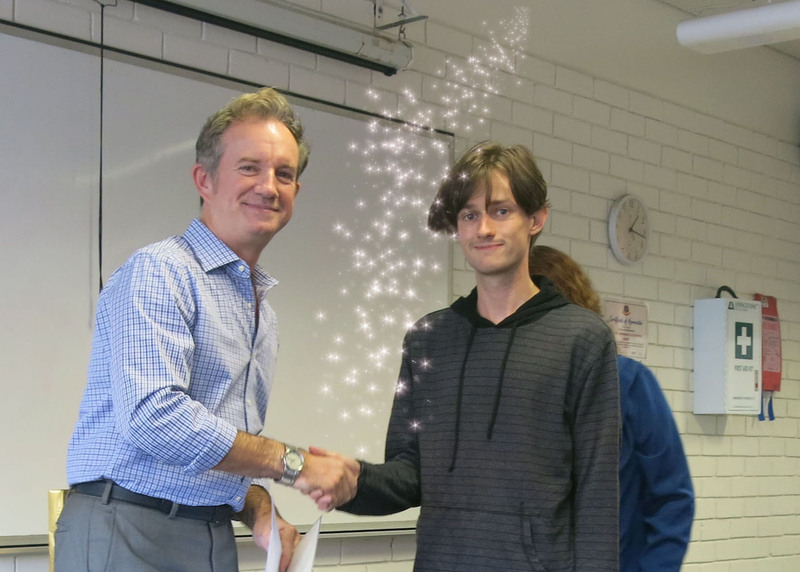 A prize giving ceremony for exceptional UNSW Mathematics and Statistics students was held on 30th May. 16 prizes were conferred to students for their outstanding academic performance during 2013. Standout students were Wen Jia Liu and Edward McDonald, who have each swept a veritable bonanza of prizes over the past two years. Wen Jia Liu, a third year Science/Computer Science student majoring in Mathematics, took home the Head of School’s Prize, the C.H. Peck Prize, and the Westpac Banking Corporation Prize. This follows on from his School of Mathematics and Statistics Prize the previous year. Fourth year Advanced Mathematics student Edward McDonald also picked up three awards – the J.R. Holmes Prize, the Applied Mathematics Prize, and the George Szekeres Award. Edward is becoming renowned for his academic excellence: he not only picked up three awards in last year’s ceremony, but he also collected a 2013 School of Mathematics and Statistics Scholarship. Glad you like our blog! Can you be more specific on what it is you want to know about? let me know and I’ll see if I can help.